Corrected an issue with the Norfair level design. If a person falls to the bottom of the water/sewer falls without missiles then they won’t be able to acquire the high jump and get out of that area. 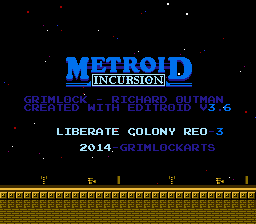 Included are 2 .IPS files, one with Snarfblam’s Metroid Plus improvements and one with the standard weapons and no mini map. Level design focused on fun factor, game play, attempt at minimizing frustration (There are some difficult areas). This review is based entirely off the original version. This does not cover the + version. 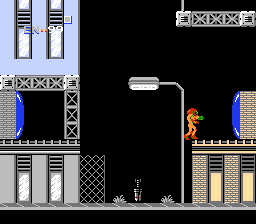 There are not many Metroid hacks that are, quite frankly, this enjoyable to play. Grimlock has done a masterful job of making a new world, and making it fun. There is not anything that is too difficult for the player, and exploring the world felt pretty natural. 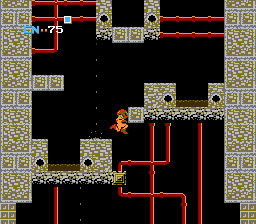 There are a couple of points where you come across one-way paths, and thanks to some nice trickery and clever level editing, he manages to pull off the “going behind previous rooms” thing done sometimes in Super Metroid. What makes it more impressive is that Super Metroid has a second layer with which to make the second “behind” path obvious. 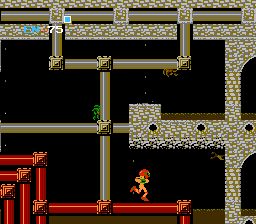 Metroid does not, but it still felt fluid and made sense when playing it. Brand new world that was not too difficult to traverse. A lot of nice graphical edits to the level tiles. Clever design allows for some very interesting exploration. 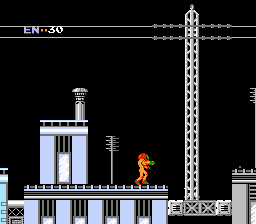 Bosses have paths behind them dropping the player off very close to the exit elevator. Bosses were a little too easy. The entrance to Kraid might be a tad bit obscure. To conclude, I thoroughly enjoyed this hack. Definitely a great find, and a game worthy of a few hours of your time. Props to Grimlock for making alternate versions too, as I believe some make the game easier if people do struggle with it.